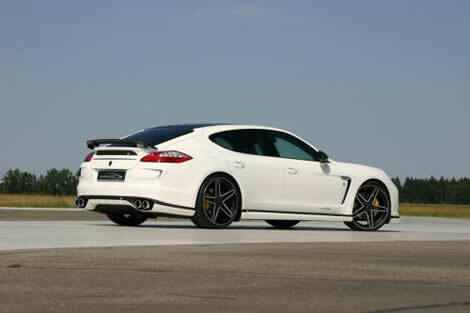 The German tuners from speedART have developed an upgrade program for the Porsche Panamera Diesel. Dubbed the PS9-300D, they’ve managed to increase the output of the V6 3.0-liter engine to 296 hp (300 PS / 221 kW) and a peak torque of 479 lb.-ft (650 Nm), up from the standard 247 hp (250 PS / 184 kW) and 406 lb.-ft (550 Nm). Aside from the power increase, speedART PS9-300D comes with an aerodynamic kit that includes side skirts, a front chin spoiler, a double wing rear spoiler, rear diffuser, as well as revised front & rear air intakes. 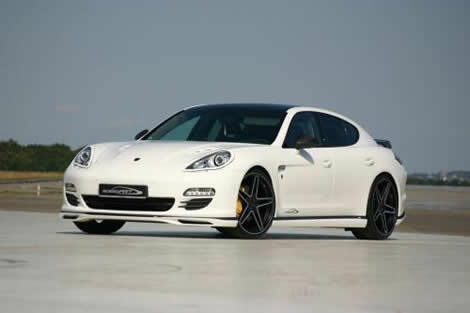 Other than that, this Porsche Panamera Diesel comes with massive 22-inch mono-block wheels that are wrapped around in 265 tires for the rims in the front and 305 rubbers for the back ones. The Porsche tuning ends with twin tailpipes that provide a more muscular look.